Justin Thomasson’s self-portrait, “Ikicki No Uta,” is one of the eye-catching works in this year's show. 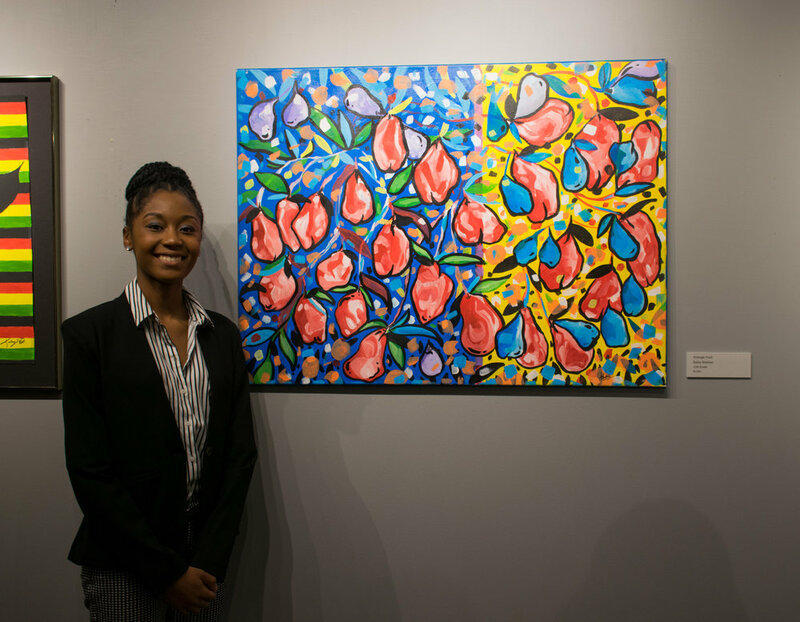 Ashia Shelton, who will be a senior this fall at PBHS, stands next to her painting "Stranger Fruit." She has two other works in this year's show. Sixteen young artists are featured in the Arts & Science Center’s 2018 Pine Bluff High School Annual Art Exhibit, on display in ASC's Simmons Gallery. 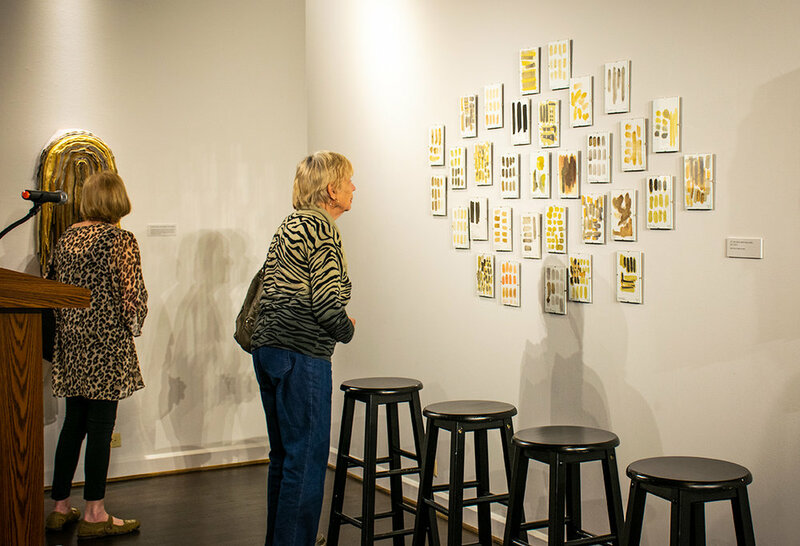 The exhibit comprises 20 works, in mediums such as pencil, colored pencil, and acrylic paint. Colorful pieces covering the walls of the Simmons First Gallery contrast with black and white pencil self-portraits. Pine Bluff High School teacher Shalisha Thomas (left), curated the 2018 exhibit of her students' works. She took over from Virginia Hymes (right), who retired last year after more than 40 years of teaching. Thomas is herself a former student of Hymes. Ashia Shelton, who will be a senior this fall, has three pieces in the show. “Stranger Fruit,” despite its deceptively bright colors, explores a darker narrative. The piece’s title is inspired by the poem written by Abel Meeropol and set to music, most famously performed by Billie Holiday. Justin Thomasson’s “Ikicki No Uta” is one of the eye-catching works in this year's show. Justin, who will be a senior this fall, drew the self portrait in color pencil. The title was inspired by a Japanese song called “Shiki No Uta,” he said. "I chose to do myself holding the guitar because that was the kind of feeling that came from listening to the song." Ashia's and Justin's talents have been recognized outside of school. They both previously lent their talents to the Drain Smart program, which uses art to communicate the function and importance of local storm drains. They each painted a drain near the Pine Bluff Civic Center complex; Ashia’s can be seen at 10th and State streets, and Justin’s at 11th and State streets. Ashia designed the Go Forward Pine Bluff logo for the task force in 2017. This spring, Justin finished second in the Omega Psi Phi Fraternity Inc. Talent Hunt, winning a cash prize and received an all-expense paid trip to Houston, Texas, where the Omega Psi Phi Ninth District Talent Hunt was held. Ashia and Justin were recently accepted into Girls State and Boys State., respectively. 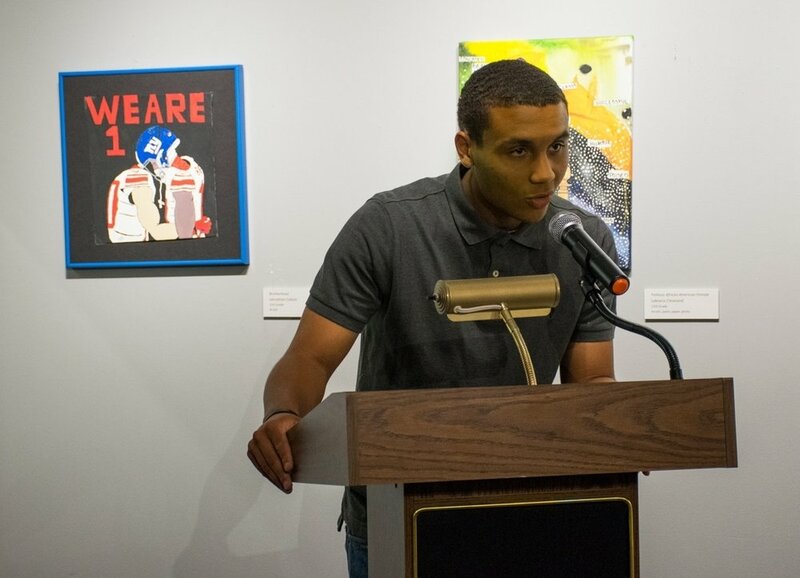 Johnathon Callum, who recently graduated from PBHS, speaks during the May 3 opening reception. 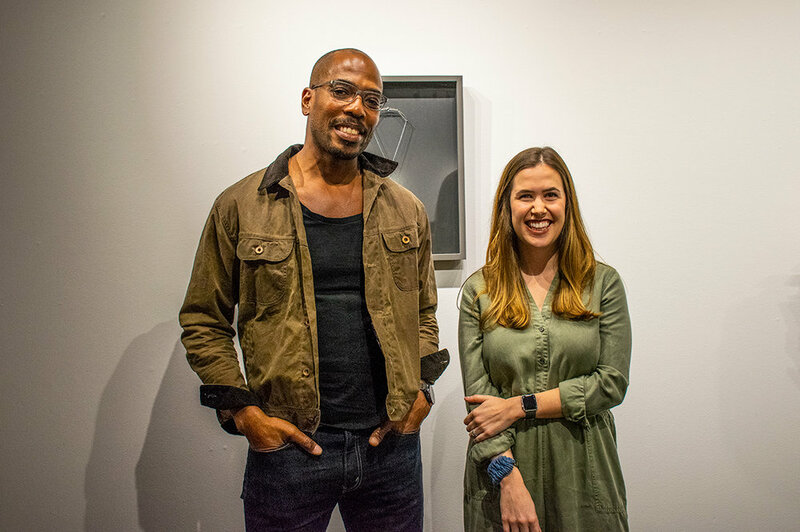 HIs piece, "Brotherhood," seen to his left in the photo, "depicts the image of two interracial players coming together during a political conflict," Johnathon explained in his artist statement. Johnathon Callum's "Brotherhood" depicts two interracial players coming together during a political conflict. "I use paint to allow the picture to pop out at you, and allow the emotions to pour out of my work," Johnathon explained in his artist statement. 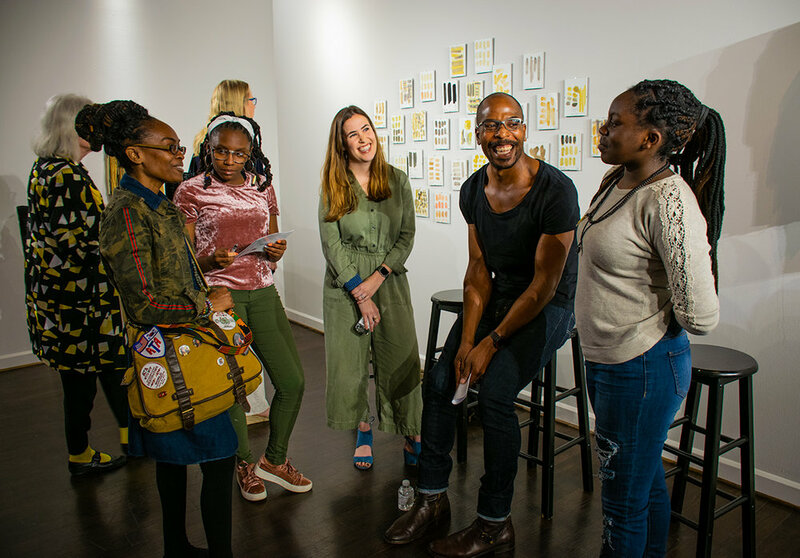 "It really grabs your attention, the reason I chose to do this is because I am currently channeling my art work toward the topic of 'Football and Politics.' Currently, NFL players are dealing with many political issues that are being covered up. I am trying to be their voice, and show them they do have people that see the injustice taking place. I hope to wake people up to the problems, so we can solve them one at a time." PBHS art teacher Shalisha Thomas curated the show for the first time this year. This was Thomas’s first year teaching at PBHS as well. She previously taught at Belair Middle School for five years. 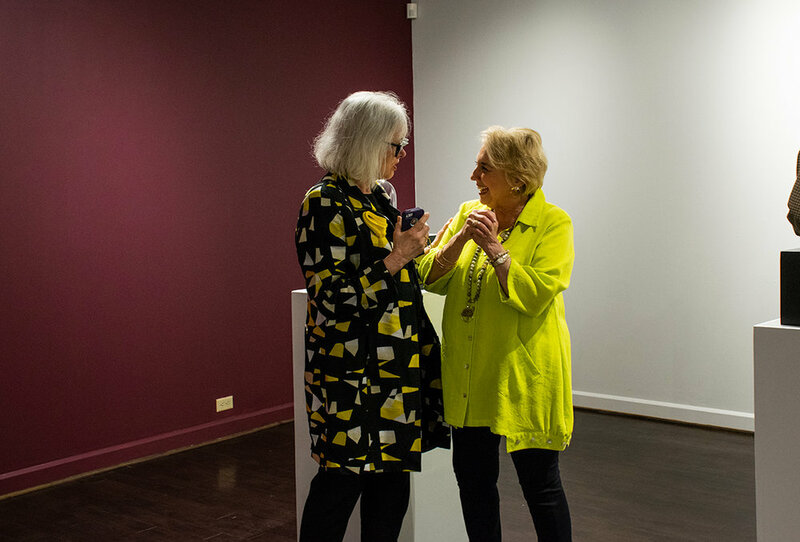 PBHS art teacher Virginia Hymes, who retired last year after more than 40 years of teaching, facilitated the show from its inception until 2017. Hymes is also an ASC board member. Thomas, herself a 2002 PBHS graduate, was one of many students Hymes inspired during many years of teaching. “The high school experience is different for each student. For me, the quiet introvert, I did not feel like I fit in at times,” Thomas said. 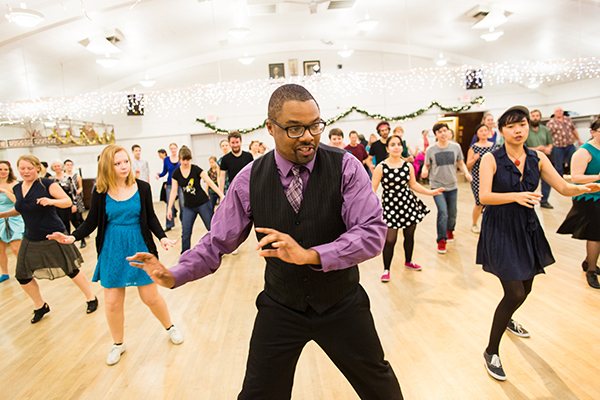 “Taking Mrs. Hymes' class in high school made me feel like I belonged. She was so encouraging, and she did not allow you to just sit in class. You had to participate! Virginia Hymes’s pride in both her former students and Thomas’ students is evident when speaking to her. "Shalisha — she’s a former student of mind. She’s a jewel." Hymes, who attended the 2018 opening reception in May, loves seeing the students show off their art with their families. The exhibit, sponsored by Pine Bluff Sand & Gravel, is on display through Saturday, July 7.
students from JF Wahl Elementary school in Helena check out "Light Hearts in Concert" Art Tower during a tour of "Imaginate" on May 9. 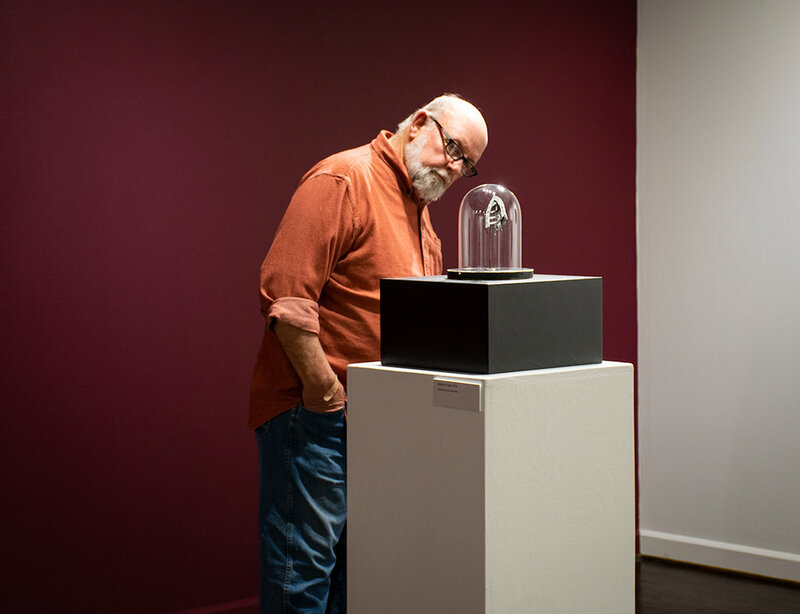 Imaginate, ASC’s latest STEAM exhibit, is now open in the International Paper Gallery. 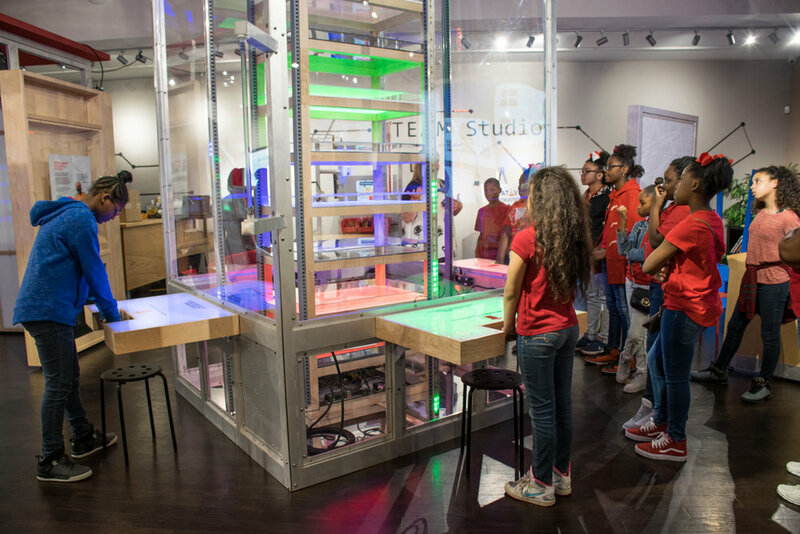 The interactive, multi-activity exhibit encourages collaboration and experimentation — two concepts that innovation and invention rely upon. All of the stations are designed to involve multiple people and creative risk-taking. The activities also encourage to visitors to think about different ways of seeing, creating, and using things. Innovation has been essential to our survival — driving the evolution of our civilization and the change in our daily quality of life. In this changing world a culture of innovation will help us meet the challenges ahead for our continued survival, both in terms of globalization and environmental changes. Whether you are doing science, art or engineering — innovative thinking can take us on the paths we have not yet explored. Many good innovations come from an understanding of the properties of the materials being used. 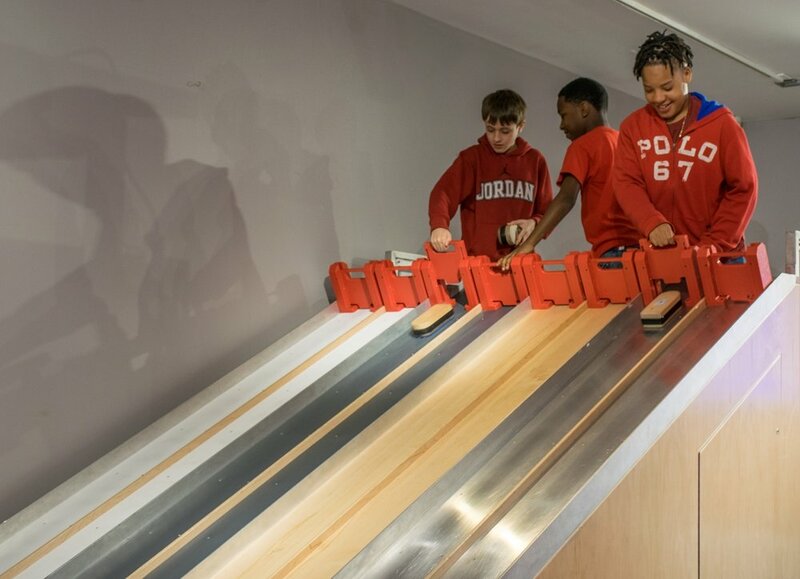 Explore kinetic friction in action by sending sliders down ramps with different surfaces. Try using heavier blocks on your slider to see how the mass affects the force of friction. Is heavier slide faster or slower? By experimenting with the surface properties of a range of materials, you can discover which combinations yield the fastest or slowest run. In this experience, one face is made of many different people. Take a picture of your own face and choose from a video collection of other people's features to create a bizarre new image. Experiment with the face you create and experiment with different facial expressions. See what makes a face beautiful to you. Of the songs on your portable music player, how many sample another song? Innovation in science and technology made this possible and changed music forever. In this room of sound and lights, you can create your own musical masterpiece involving rhythm, light, pattern and emotion. Step inside play and experiment with sets or samples programmed into the sound walls. Collaboration lets you work with each other's sounds, and competition and collaboration push and pull you to be more creative. Work together and have fun! This interactive light sculpture is powered by heartbeats. When you and a group of friends interact with it, the sculpture interprets your heartbeats and integrates them into a light show. Hold onto one of the four bars — the bar has a heart rate monitor built in. Your heartbeat becomes the drum to which the lights dance. The more people connected to the sculpture and the more heartbeats in combination, the grander the display. “Light Hearts in Concert” is designed to inspire experimentation as a team and to visually celebrate each individual as a necessary and valued part of a whole. Discover the unexpected — explore materials both nature and manmade. Consider how nature has inspired man-made products. Explore the unexpected ways of using materials, and different ways they have been repurposed. Use the microscope to examine the details of a wide range of fun materials. 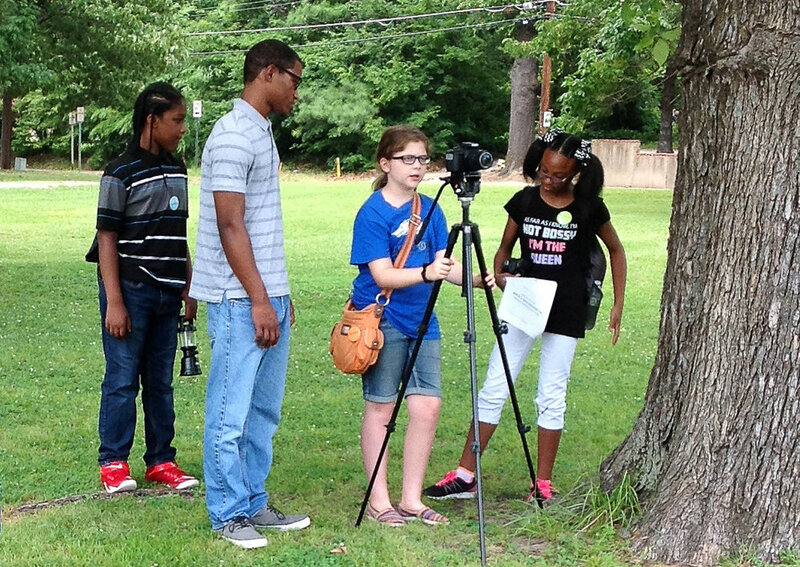 A'Niyah Jones, 7, makes her own small film at the Stop-Motion Animation station. Create your own animation short using small toys and other objects. Capture your scenes with a fixed camera and easy-to-use touch screen interface. When you are finished with your story, play your movie to see your figures come to life on the screen! Imaginate is the latest interactive traveling exhibit on loan from the Arkansas Discovery Network, a statewide museum partnership operated by Museum of Discovery in Little Rock. 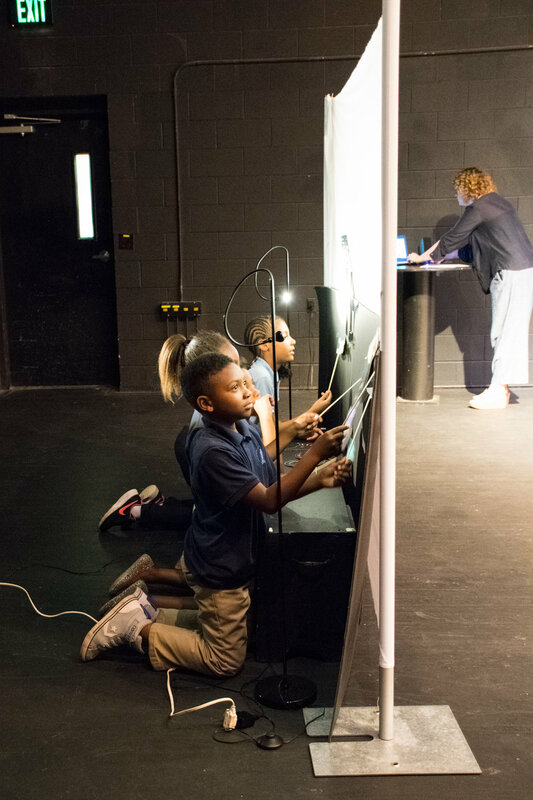 The traveling exhibits makes interactive STEM learning more accessible to the state’s children and their families. 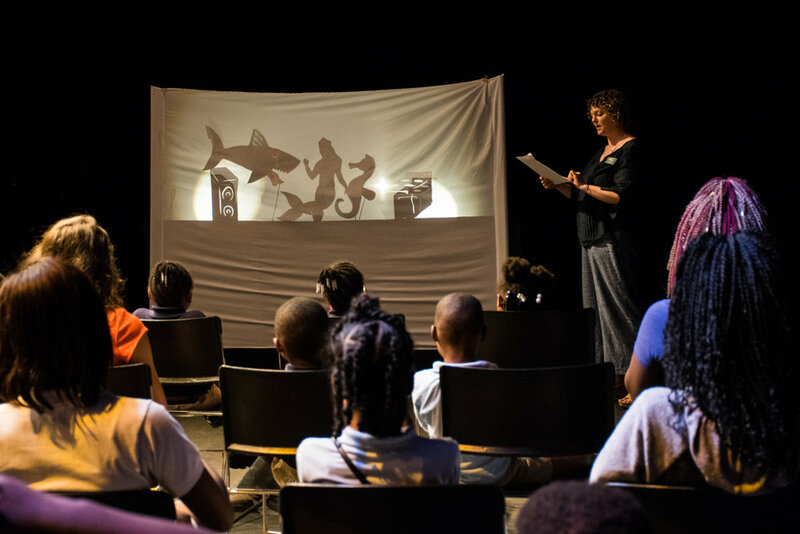 Imaginate is sponsored by the Pine Bluff Area Community Foundation, an affiliate office of the Arkansas Community Foundation, Inc. Explore Imaginate through Saturday, October 6, 2018. 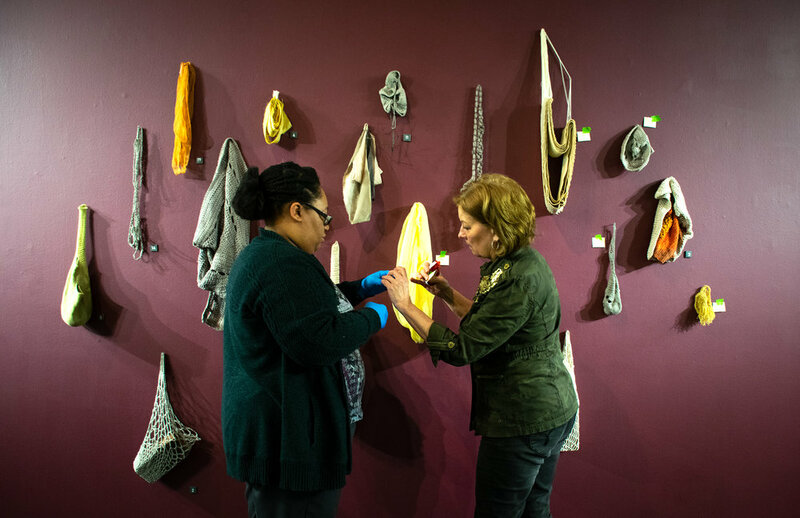 ASC Digital Media Specialist and collections care assistant ashely smith (left) and ASC Curator Dr. Lenore Shoults finish the installation of "fire & FIber: New Works by Sofia V. Gonazalez and David Clemons" on Tuesday, April 24, in the William H. Kennedy Jr. Gallery. 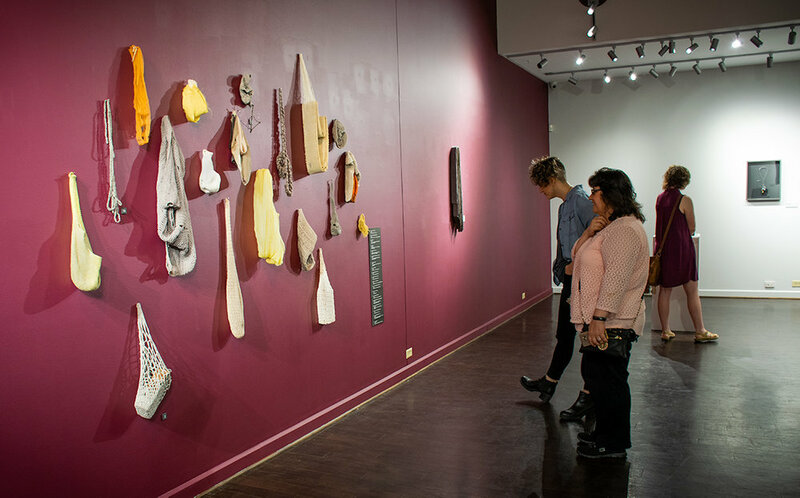 Metal and fabric come together for the Arts & Science Center for Southeast Arkansas’ latest art exhibit, Fire & Fiber: New Works by Sofia V. Gonzalez and David Clemons, opening Thursday, April 26, 2018, in the William H. Kennedy Jr. Gallery. The exhibit kicks off with a reception from 5-7 p.m. April 26. The artists will be on hand to make remarks at 5:30. 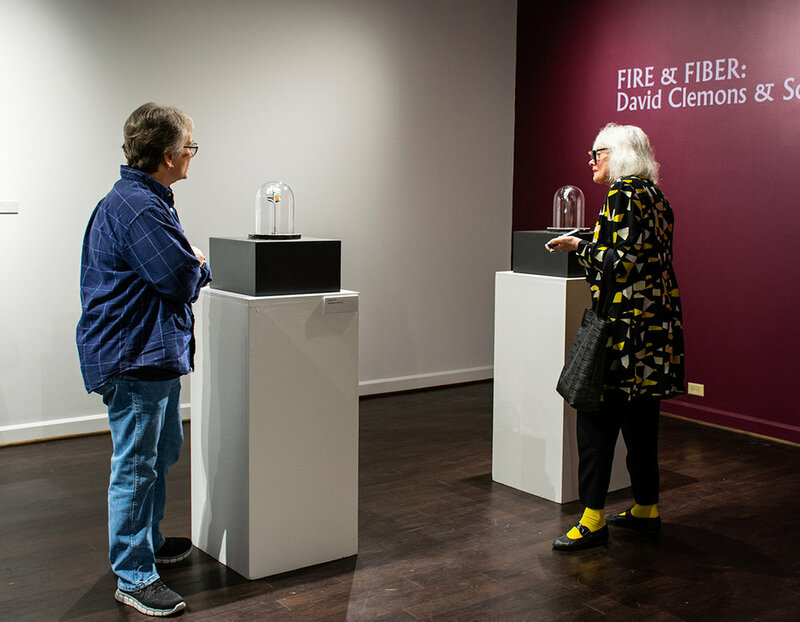 Fire & Fiber features the work of metalsmith David Clemons and fiber artist Sofia V. Gonzalez. 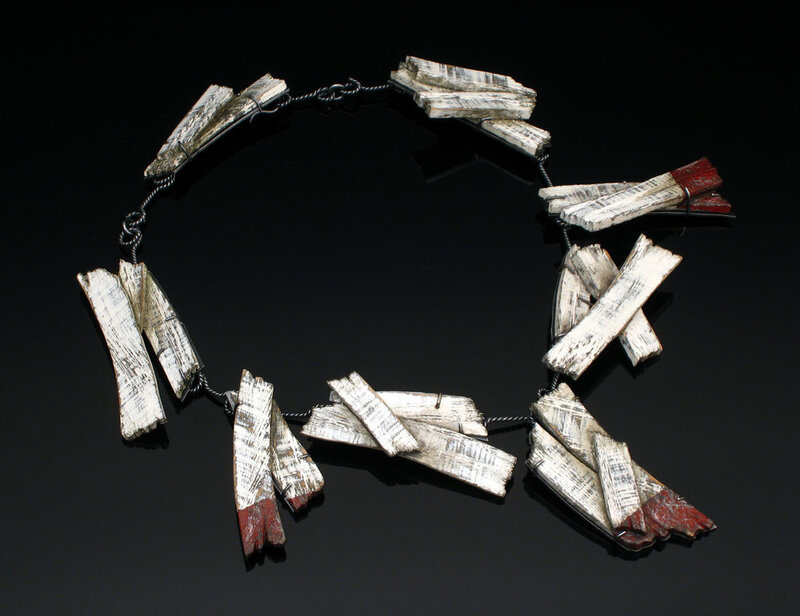 “The organic nature of both artforms comes together in a sumptuous feast for the eyes,” says ASC Curator Lenore Shoults, Ph.D.
Clemons is an artist in residence and instructor in metalsmithing and jewelry in the Department of Art and Design at the University of Arkansas at Little Rock. He has a Master of Fine Arts degree in metalsmithing from San Diego State University. 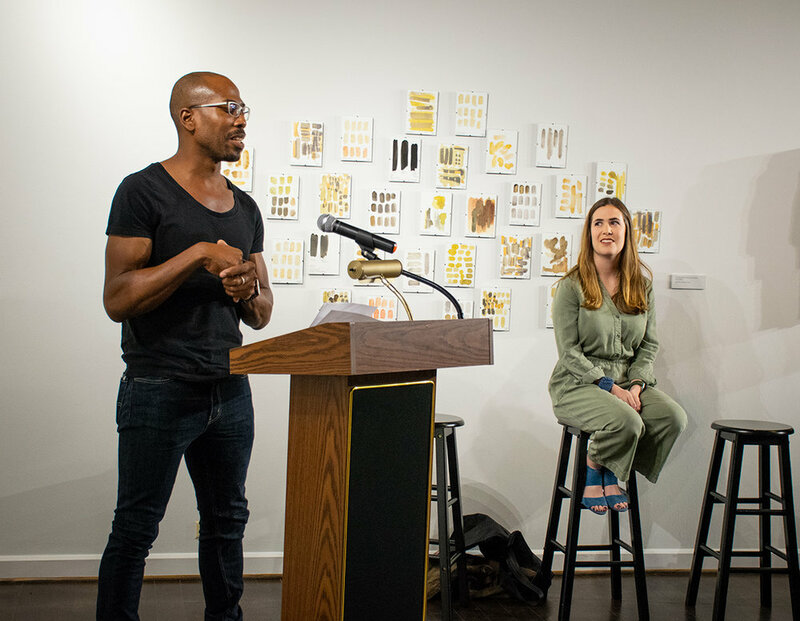 “My studio work has always been an extension of the experiences I have internalized, and I dissect my experiences and tease out greater awareness of the impact levied by each experience,” Clemons says in his artist statement. “My practice has become deeply introspective as probing my understanding of loneliness, friendships, creativity, Southern culture, fatherhood, and finding a new sense of place and redefined identity have been my source material. This personal exploration has been difficult at times as I do not always feel I have the adequate tools or emotional distance to gain insights into some of these uncomfortable mental places. “The nagging question at the root of the work is: What happens as you confront and reconcile the mental image of yourself with the reality of who you must be, based on the demands of your life? This was the question I pondered sitting on a rocky shore line watching a boat struggle against the waves to reach open sea. The infinite possibility in the vast expanse of the ocean posed a physical and metaphorical escape; this is an escape with brilliant potential but fraught with danger. The seeds for this body of work initially grew in the form of a short story inspired by this observation. The story chronicles a character fleeing from captivity only to meet an uncanny stowaway on his boat. I found myself being more enticed by the objects I began sketching than the written words. The objects have nautical references and heavily feature crude boats and warning buoys foreshadowing impending destruction. Gonzalez is an adjunct professor of art at the University of Central Arkansas and UA-Little Rock. She has an M.F.A. from California College of the Arts in San Francisco, where she focused on furthering her skills in textiles and natural dye techniques. She was a 2017 Hot Springs National Park artist in residence. 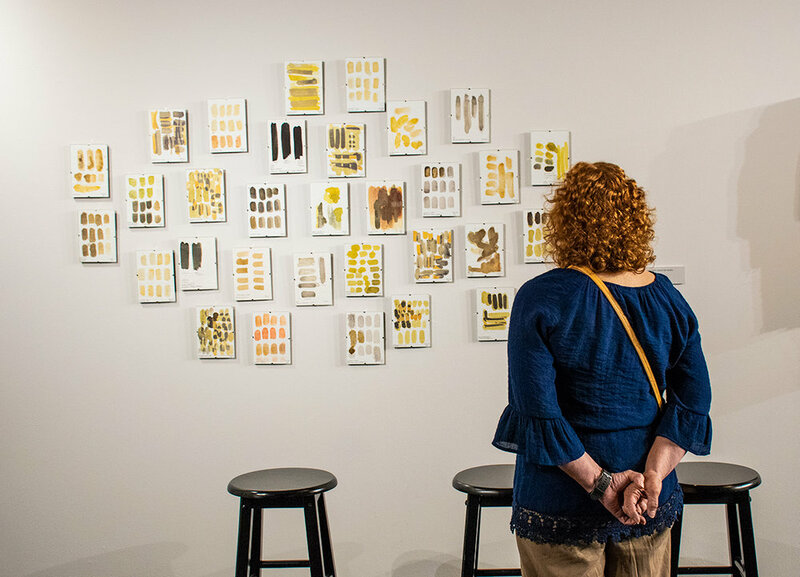 The Arkansas Arts Council awarded her an Individual Artist Fellowship in Contemporary Craft in 2017. “As a maker, I feel a frantic urge to record the places I have known, such as northern California and central Arkansas, to attempt to embody the way these locations have shaped me and the way I feel within them,” Gonzalez says in her artist statement. “Recording and archiving both physical and emotional landscapes, I create a moving methodology to respond to places that have already affected me and those I will meet in the future. “Collecting flowers, hulls, barks, fruits and vegetables, I boil the materials to release the inherent colors of the land. 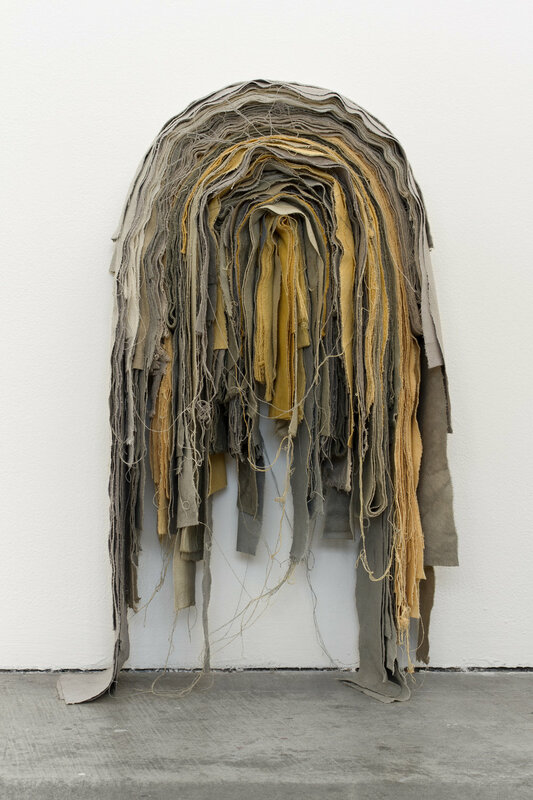 Sewing, looping, and layering naturally stained textiles focuses a restless mind as I archive through making to respond to the fear of what may happen when a place changes. A homesickness for places I still know saturates each stain and reveals a constant concern of what might happen when a specific site and I are no longer connected. The fleeting feeling of place leaves me frantically trying to grasp onto something I cannot hold. To keep still, my hands must move and I ground myself in the physical plants and fibers. I knot, loop, cut, and drape dyed textiles to focus and to remember the intimate moments in each place I know. The cardinal singing in the backyard at dawn is woven into each crocheted thread, actually colored by the neighboring summer weeds. This exhibit marks the debut of the gallery’s new LED lighting, which was made possible by the generosity of the late Diane Ayres. She was a longtime supporter of ASC. The exhibition is sponsored by Relyance Bank, the Arkansas Arts Council, and the Pine Bluff Advertising & Promotion Commission. Fire & Fiber runs through Saturday, July 28, 2018.